Why do I do the things I do? Why am I so angry? Why is my friend so depressed? Why was my family awesome one day, but now it seems like guerilla warfare? Why do I get angry in traffic? Why is she so critical and controlling? Why is he so ungrateful? Why is she so afraid? Why won’t he talk? Why am I the way I am? The simple answer is: the heart. What is the heart? The heart is not just a muscle that pumps blood, the shape of a card you receive on Valentines Day, nor where romantic feelings come from. It is said that you cannot understand a human until you understand the heart. 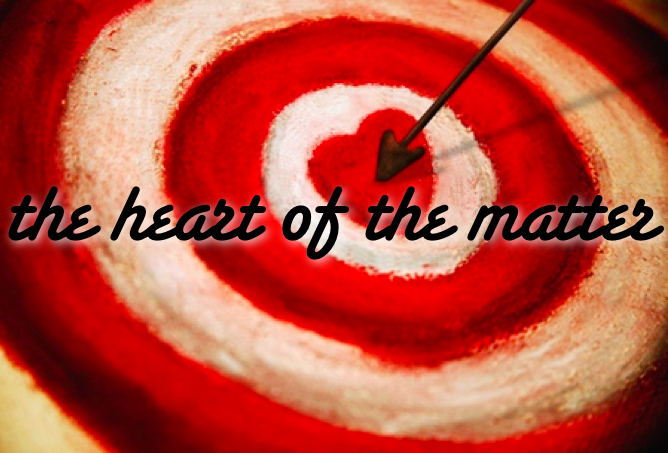 The Bible describes the heart as your inner man [spirit, soul, mind, emotions, passions, will, etc.]. The heart is the real you, where your beliefs affect your behavior. It is the control center of a your life. There is something seriously wrong with your heart. Your control center has a glitch in the main frame. What is the matter with the heart? It is stained with sin. Sin is like the fat that clogs your heart from functioning properly. Sin is like eating a constant diet of junk that will eventually kill you if you do not do something about it. Sadly, there is nothing you can do about it. However, God has done something about it. He has given you Christ whom if allowed will do surgery on your heart opening up the clogged arteries and capillaries so His life-giving power can clean you from the consequences of sinful living. When the Bible speaks about fruit, it is usually referring to the responses to your behavior [what you do and think based on what you believe]. The fruit is what speaks in Luke 6:43-46. Jesus says something very powerful about words [i.e. fruit]: they flow from the heart [cf. Matthew 5:21-30]. Now it is important to understand that people and situations do not cause you say what you say or do what you do. Why can’t people cause you to sin? This may fly in the face of modern psychology and self-esteem talk, but you alone are responsible for the way you respond to people and situation. People and situations might influence you to sin because you are being blamed, threatened, manipulated, piled on with guilt, or spoken to unjustly, but you are the root causer of your responses to these influencers. Your words and responses are revealed in the fruits of your heart. When the Bible speaks about roots, it is usually referring to your heart [where beliefs are born, incubated and grow]. You have the kind of fruit you bear because of your roots. You will speak and act the way you do because of what is in your hearts. The heart is how you function. Your sin problem is a result of our heart [cf. Matthew 23:25-26; clean cup]. You cannot change your behavior until you change your heart. How can you change your heart? It begins by a change of belief [roots], which will affect your behavior [fruit]. When I was growing up my gramps had an apple tree. The apple tree didn’t produce many apples. It began to produce dry, wrinkled, brown and mushy apples. Knowing my gramps he would try to remedy this problem. Let’s say gramps went out to the tree with trimmers, a staple gun, stepladder and a box of Washington apples he bought from the grocery store. He decides to cut off the bad apples and puts on the new store bought ones. Did he fix the tree? Stapling apples will not help because the new apples will rot too. Change that doesn’t reach the heart [roots] does not last. Cosmetic changes never satisfy. Are you stapling? What kind of fruits are you trying to staple in place of actually changing? In Ezekiel, the spiritual leaders of Israel come to the prophet because they have questions they want to ask of God. As they come to the prophet he sees something is wrong with them. What is wrong with them? [Idolatry] What kind of idols? [In their hearts] These idols run deeper than cultural or religious idols they are idols inside the heart of man. What is God’s response? Idols in the heart are a ”stumbling block before the face” Ezekiel 14:3 If you put your hands in front of face and walk about the room you will not make it far without stumbling. That is exactly God’s point about idols of your heart; eventually, they will cause you to sin. What do you love? Hate? What or who do you trust? Who do you seek to please? Whose opinion matters most? Who are your role models? Who do you want to be like? What makes you tick? If this were your last day on earth what would you do? How would others describe you on your deathbed? What is your definition of success? What would make you feel rich? What brings you greatest joy? What do you desire, crave, lust, and wish for? What desires do you serve and obey? What is your life aim? Goal? Purpose? Where do you bank your hopes? What do you fear or worry about? Where do you find refuge, safety, comfort, escape or security? What do you pray for? How do you live with yourself? Where do you find your identity? How do you define what you are? Next week we will talk more about understanding your heart and in the weeks that follow how to guard your heart from influencers in our world seeking to distract you from giving all your heart toward God. are you ready for warfare?